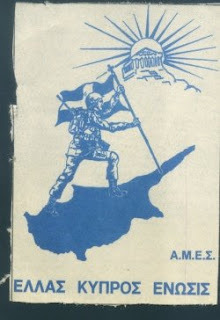 The Acheson plan devised by the Americans (and the British) for the partition of Cyprus was presented in the first half of 1964 following the intercommunal fighting that had broken out on the island in December 1963. It proposed union of Cyprus with Greece, on the conditions, inter alia, that Karpasia (and Kastellorizo) would be ceded to Turkey; that semi-independent Turkish zones would be established throughout the island; and foreign commissioners would be appointed to safeguard the pervasive rights to be granted the Turkish Cypriots in the Greek part of the island. The plan not only strictly curtailed Greek sovereignty over the island – by handing over a large part to Turkey; by granting Turkish Cypriots administrative rights that amounted to the creation of micro states within a state: and by allowing Britain to retain the three percent of the island that it held as sovereign territory – but was also so cumbersome and dysfunctional that it was hard to imagine how it would have survived any serious strain, with the result being conflict and a much cleaner form of partition – as imposed by Turkey in 1974. The Acheson plan was rejected by Cyprus and Greece, while Turkey, though not expressing outright rejection, did not endorse it either. A second, even more perfunctory, plan was subsequently presented by Acheson, but this was not seriously pushed by the Americans, particularly as Turkey let it be known early on that it found Acheson 2 unacceptable. The details of both plans are presented below. Both have a back-of-the-envelope feel about them. What is significant about them is not necessarily the intricacies of what they propose; but that the US had decided by 1964 that the optimum solution for Cyprus was some form of partition and that this is what it would work towards from now on. 1. To give Turkey assurance that its security would not be threatened from Cyprus or from the direction of Cyprus, Greece would cede to Turkey a portion of the island in perpetuity, that is in full sovereignty. A. This area would be used by Turkey as a military base with full rights to deploy ground, air and naval forces therein. The military purpose of this base would be to deny the island to hostile forces as a base of operations against Turkey and to keep open the approaches to the ports of Mersin and Iskenderun. B. The area should be fairly substantial in size, large enough both to permit the building of facilities and the conduct of training manoeuvres and operations. C. It seemed that a logical location for the base area might be the Karpas Peninsula because it was detached from the main body of the island and was ideally situated to cover the approaches to the Turkish ports. Different boundary lines for a base on the peninsula were discussed at different times; one, which appeared to be the minimum acceptable to the Turkish government, ran from Peristeria on the north coast to a point just south-west of Boghaz on the southeast coast. (The Turks agreed that the Monastery of Apostolos Andreas, near the tip of the peninsula, could be excluded from the base area). C. The Turkish Cypriots would necessarily have to be citizens of whatever central authority was in control of the island. Subject to the privileges and responsibilities of this citizenship, they could have the local and personal rights and privileges indicated in the preceding two paragraphs. It goes without saying that they would be guaranteed all normal human and minority rights, of which those provided in the Treaty of Lausanne are good examples. D. As a special safeguard in addition… there should be an international commissioner or commission, perhaps appointed by the UN or the International Court of Justice, who or which could be physically present on the island and charged with watching over the observations of the special status and rights of the Turkish Cypriots. Precedents for this exist in the cases of Danzig and the Soar during the period between the world wars, and the US government considers that this experiment worked well until the advent of Hitler to power in Germany upset all established arrangements. The commissioner or the commission would be empowered to hear complaints, investigate them and make recommendations to the appropriate authorities for correction of injustices. It is conceivable that he might be empowered to order correction and or compensation subject to appeal by the party opposed. If his recommendations or decisions were not accepted by one party or the other, there would be a right of appeal either to the International Court of Justice at the Hague or to some other judicial body which might be specially established under the authority of the UN. An alternative the parties might wish to consider would be for the commissioner and the court to be appointed by NATO, with the NATO members assuming responsibility for enforcement of their decisions. E. The island of Kastellorizo to be ceded to Turkey. 1. The Turkish base area simply be leased to Turkey for an agreed period of years – 50 was suggested as reasonable – instead of being ceded as sovereign Turkish territory. 2. The boundary of the base area on the Karpas peninsula would be a line drawn north and south just west of the village of Komi Kebir (thus reducing the area considerably). Alternatively… the line could be drawn on the basis of military considerations after study by the Supreme Allied Commander for Europe. 3. The special provisions and guarantees for the Turkish Cypriots would be modified from those in Acheson Plan 1 to eliminate the special areas containing a Turkish Cypriot majority which would have been treated under the first plan as moderate administrative units. Instead, it is suggested that at least two of the eparchies into which Cyprus might be divided under Greek rule would always be headed by Turkish Cypriot eparchs. These eparchies would always be those containing a substantial Turkish Cypriot population. In the eparchies containing such a substantial Turkish Cypriot population, the administrative staffs and police would always contain a substantial proportion of Turkish Cypriot officials and employees. 4. Instead of the central Turkish Cypriot administration in Nicosia which was proposed in Acheson Plan 1, there would be a high official in the central government of Cyprus, under the chief Greek administrator, who would be provided with a staff and would be charged with looking after the rights and welfare of all Turkish Cypriots. This official would advise and assist Turkish Cypriots, receive and investigate complaints about discriminatory treatment or failure to give guaranteed rights, and could appeal to the courts or central government of Greece in case of need. 5. The special guarantees or minority rights envisaged in the first plan, such as those provided by the Treaty of Lausanne and the European Convention on Human Rights, would be retained. Similarly, the proposed International Commissioner appointed by the UN would be part of the second plan as of the first.